I was at the Boston Design Center yesterday for a panel discussion with Dara Caponigro, editor-in-chief of Veranda Magazine (which was great, more to come on that soon) and stopped into one of my favorite showrooms, Century Furniture. They had a lot of new gems on display which I wanted to share. First off, I loved the displays of accessories such as the classic blue and white china, the calligraphy brushes (apparently, they are thing in decorating, who knew?) and the charming flowering “plant” made from metal in the top image. The calligraphy brushes are works on art all on their own, aren’t they? This velvet and illusion pillow had me at hello. The showroom is debuting the new Charlotte Moss collection, including this adorable trompe l’oeil chest called Her Louisville. There is also a His Louisville Chest available as well. 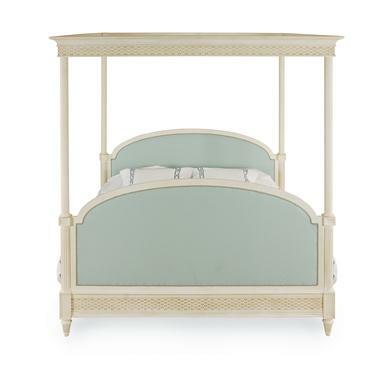 The featured vignette in the showroom is the new Atlanta Canopy Bed from the Charlotte Moss collection. Ms. Moss is know for her beautiful bedrooms featuring 4-poster and canopy beds and this one does not disappoint. The bed is flanked by the Auburn Nightstands. As always, the Richard Frinier Andalusia chaise with canopy looks so comfy and inviting after a day traipsing around the BDC. BravoTV – A Swirling Mass of Information?